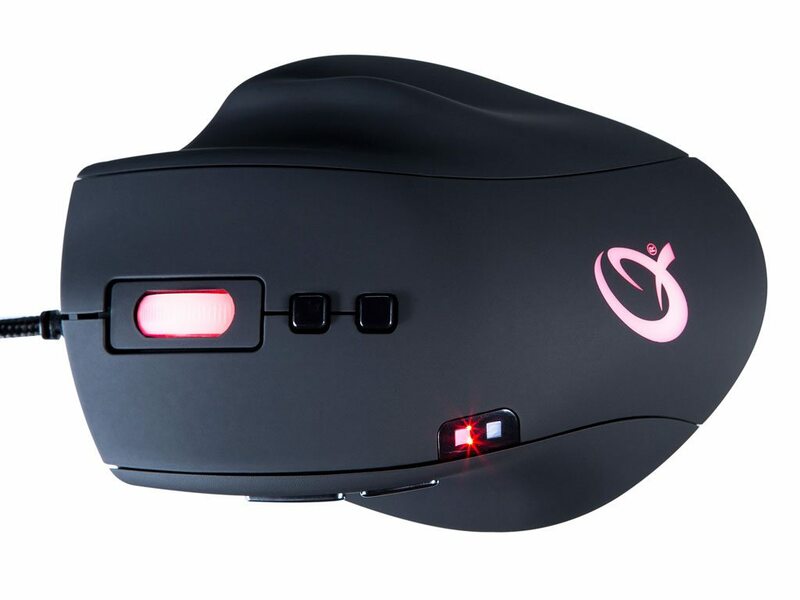 Today we’re looking at the QPAD 8K, a laser gaming mouse. The 8K includes a high-DPI laser sensor, fancy RGB lighting and a ergonomic five-finger grip. It’s been a long time since we’ve reviewed a QPAD mouse, so I’m curious to see what I’ve been missing! The QPAD 8K is a clear member of the “wide as heck” family of gaming rodents, with a shape designed to accommodate the full width of your hand. 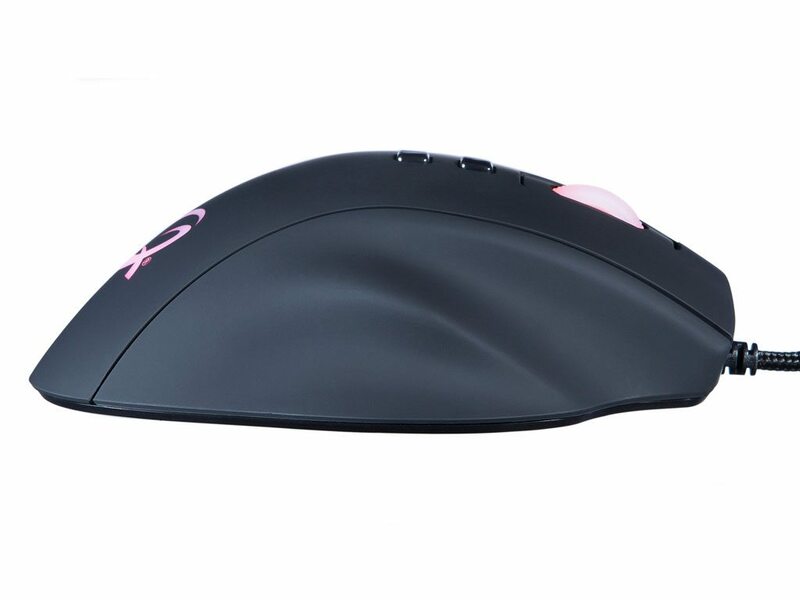 This is great for pushing the mouse back and forth in comfort, but means lifting it is a bit awkward (as there’s nothing to grip onto on the right-hand side). Now, let’s go on tour to see how the mouse is constructed. Starting on the left, we can see the mouse has two side buttons (mapped to back and forwards in Windows, and freely mappable in games). There’s no specific grip section, but the shape is contoured to fit your thumb. There are two small LEDs here that indicate your current profile. 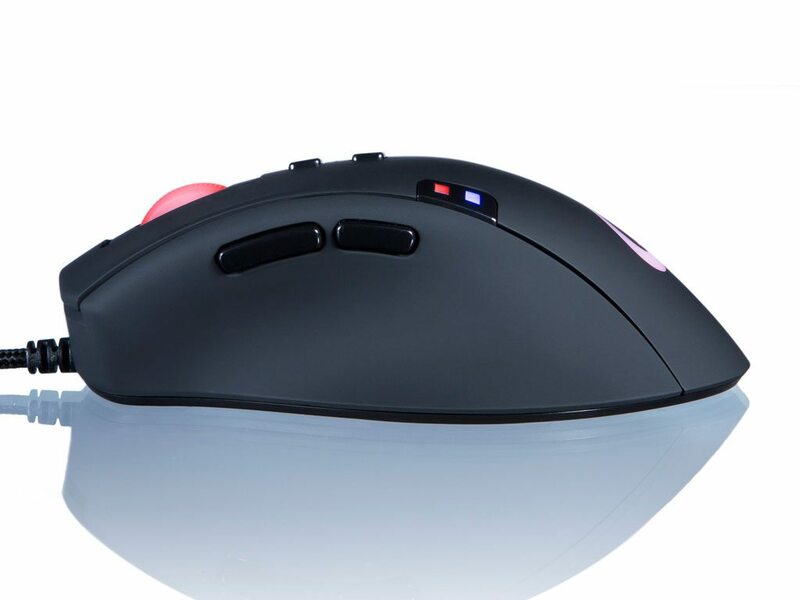 On the top of the mouse, we have a pair of small buttons, which by default adjust the 8K’s sensitivity. There are also two LED backlit elements: a scroll wheel with fine notches and a QPAD logo. The left and right buttons are a standard length, and sit atop Omron switches. The right hand side is bereft of buttons and grippy sections. It’s contoured to fit two rightmost fingers, as mentioned earlier, so you can rest your hand there in comfort. 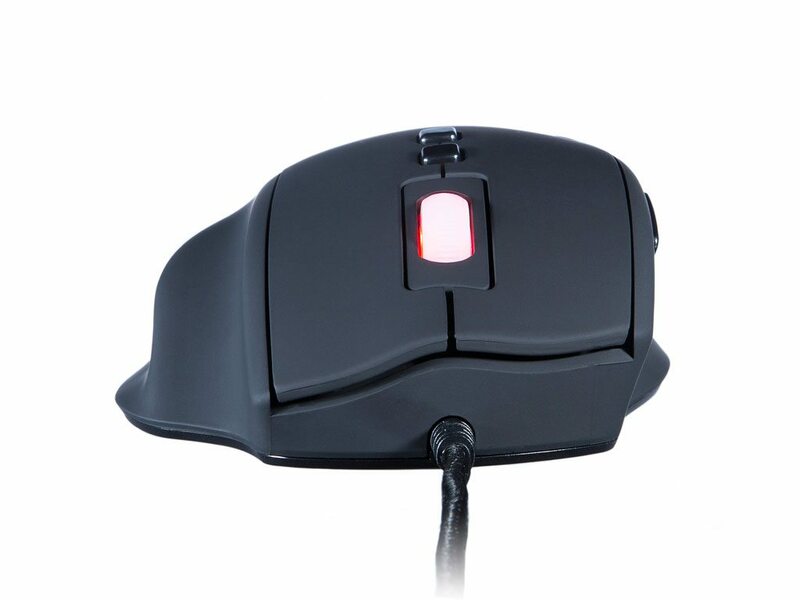 The bottom of the mouse is quite wide, with the laser sensor in the centre. There are four skates on the four cardinal directions, but no other features – no removable weights, no additional buttons. The 8K is a fairly attractive mouse, with a simple matte black colour scheme. It’s not as stylish as the Cougar 700M, but there’s little to complain about here. The 8K comes with a simple but powerful software component, allowing you to customise the mouse’s lighting, buttons and other settings. I was surprised to see the range of lighting options available. 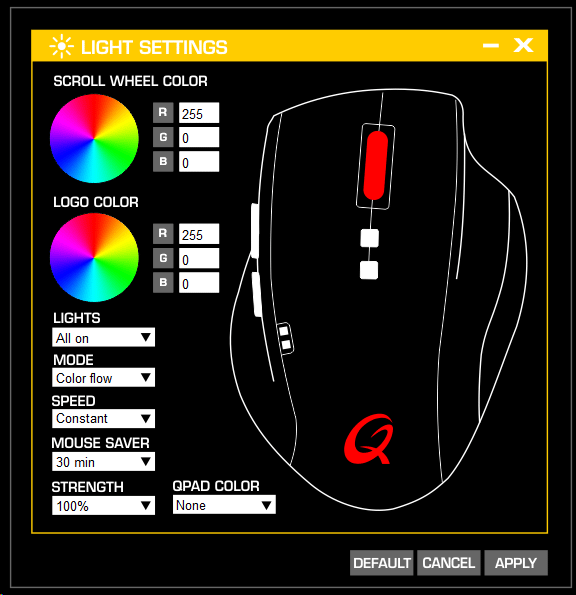 You can choose RGB values for each of the scroll wheel and the QPAD logo, as well as choose when the lights are on. You can keep them on permanently, have them gradually fade, and you can even set up the rainbow cycling effect that works so well on RGB mechanical keyboards like the BlackWidow Chroma. Macro recording options are again quite comprehensive, with options for customisable delays and multiple replays. There aren’t quite enough extra buttons to really make this a must-have feature, but it’s still nice to see. Advanced settings is ironically the first place you should probably visit. 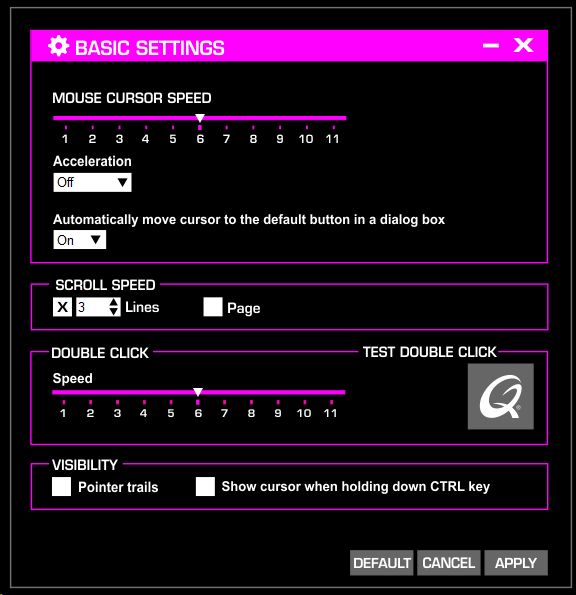 Pro gamers tend to use very low sensitivity settings (400-800 is standard for CS:GO pros, for example), so you might want to try that. Angle snapping is good for Photoshop use, but should be turned off for gaming. Lift off distance is another useful thing to change, depending on how you often you tend to lift and re-centre your mouse. 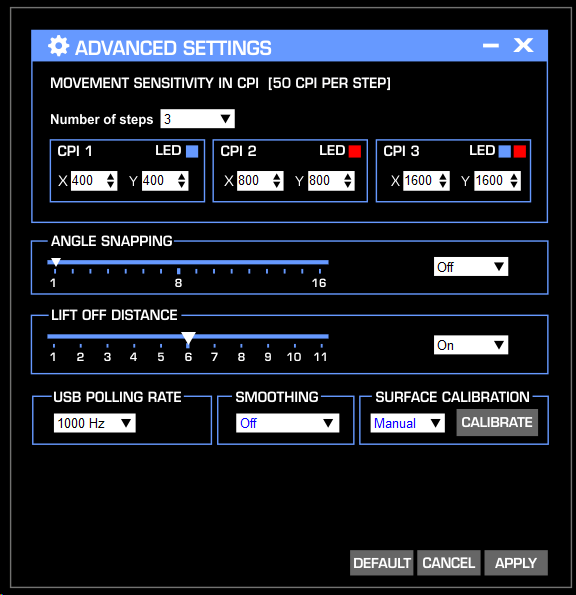 Finally, there is the option for calibration to the surface that you’re using. Basic settings mirror those in Windows, which is helpful for ensuring you’re on the recommended 6/11 mouse speed and acceleration is turned off. Finally, you can reassign each button’s functionality, although you’d probably do well to leave them alone. The only ‘spare’ buttons are the two top buttons, but they’re hard to press mid-game, so best keep them on sensitivity adjustment duty. I used the QPAD 8K for a good three weeks as my primary gaming and work mouse, replacing the old TT eSports Saphira that has been my long-term mainstay. I played a lot of Counter-Strike during this time, ranking up from around Gold Nova 4 to Master Guardian 2 (woo, go me!). I also played a range of other games, wrote quite a few articles and did the usual Photoshop work. I found the Avago 9800 sensor used here to perform as well as ever, with accurate tracking at low or high DPI settings. The scroll wheel worked well, the side buttons were easy to press, and generally there was little to complain about. The only real drawback to the 8K is one that may not even affect you. I personally quite like to lift my mouse often while playing, in order to re-centre on my (smallish) mousepad. This is quite easy with a small and thin gaming mouse, as you can lift up on the left and right hand sides equally to re-centre without knocking off your aim. 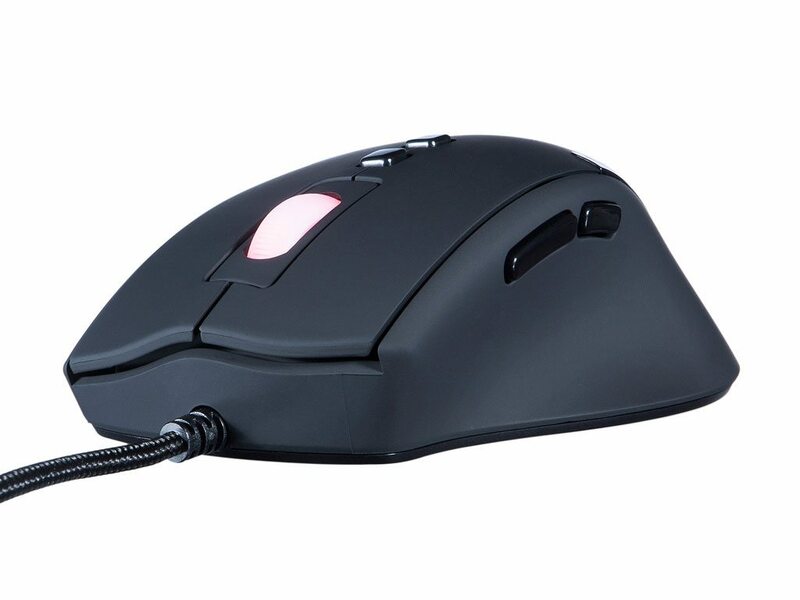 On the 8K (and other wider mice), the flat right-hand side doesn’t provide anything to grip, so you end up lifting the left hand side, which skews your aim unless you do it really slowly. That means doing big turns at low DPI settings is quite difficult, and it definitely led to a few extra deaths in Counter-Strike. Besides this drawback, endemic to all wide mice, the 8K performed well for all the games I tested it in, from Civilization to StarCraft, Deus Ex to Grand Theft Auto. The 8K isn’t designed for cruising through spreadsheets, but it stands to reason that any mouse connected to your PC will be used for plenty of things other than games – like work. Lovely, necessary, work. Here the wide, comfortable shape of the 8K acquits itself well. The scroll wheel feels sturdy and operates smoothly, making surfing the web an easy proposition. The convenient DPI adjust buttons are useful for Photoshop and the like, and turning on the rainbow cycling LED mode brings a bit of joy to your boring office job. 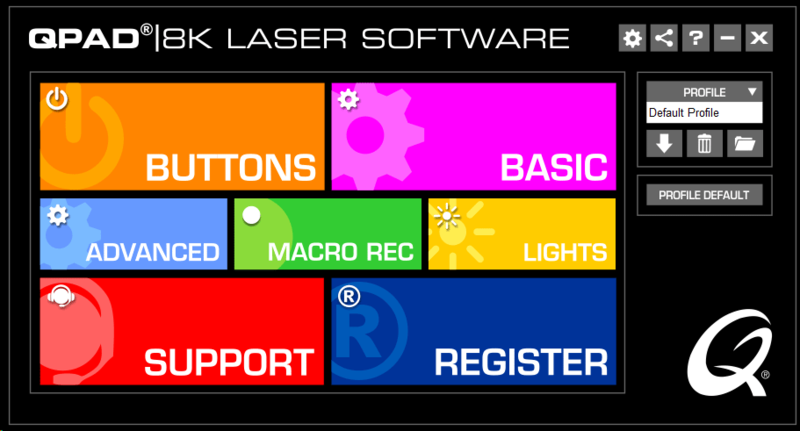 You could even write some macros in the included software, and automate some of the more mind-numbing bits of your job. Awesome. 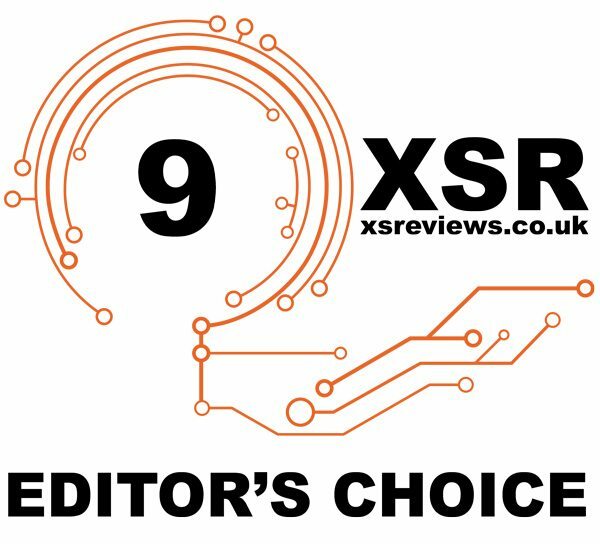 The QPAD 8K Laser is a top-notch gaming mouse, well supported by what is perhaps the best-designed gaming mouse software I’ve ever used. The simple matte black look is enhanced by fun RGB lighting, allowing it to easily match your other peripherals. While its wide shape makes it hard to lift in the middle of a firefight, it’s otherwise excellent for gaming and a great choice for a wide range of genres.